Describes how you can setup Trisul for capturing and writing to disk at 10Gbps and higher speeds. 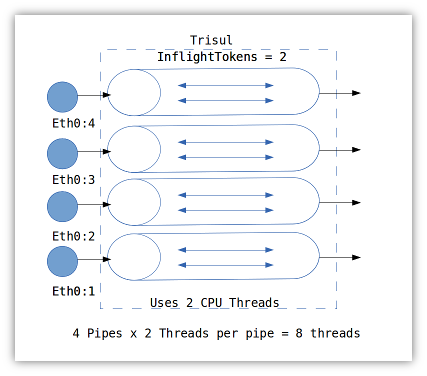 Trisul can use any number of threads but the number of active pipeline threads is determined by the InflightTokens parameter in the config file . By default the value is 2, which means Trisul at full load will use around 200% CPU. 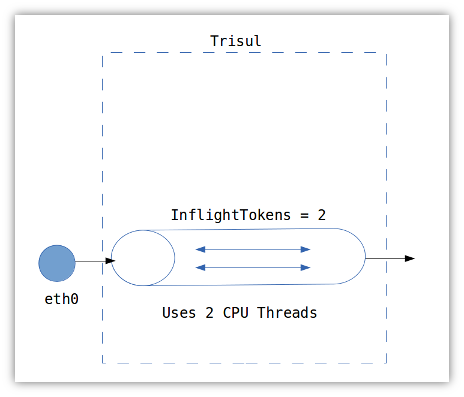 If you increase the InflightTokens parameter to 4 you will find that Trisul’s CPU usage goes up to 400% and you are able to process higher speeds. However, there is a point of diminishing returns after about 4 hardware threads. Increasing further will actually reduce the throughput. At this point, you’ve maxed out on what you can do with a single port. On an mid range processor, the optimum we’ve measured is about 2-3Gbps using 2 hardware threads. Fortunately there are ways to open up multiple input streams or ports. This is mostly done by flow aware load balancing techniques. As we’ve seen, at very high packet rates there is too much contention at the single input port. The trick is to split the incoming traffic into multiple streams and have Trisul use them. Often this requires hardware support. The architecture looks like this. Once you have the inputs set up, you can use Trisul’s support for capturing from multiple adapters to complete the setup. We show how to do this for some common input methods. How to create 4 pipelines with PF_RING. Start trisul with pfring mode. Restart Trisul. This will startup 4 pipelines. Only for stream 0; set the hashing mode and config commands, see Napatech docs for more details. Typical values are shown below the fields. Start trisul with napa mode. We havent tested Myricom as yet, but this should work with their libpcap compatible driver. Create 4 streams using the tools provided by the vendor. Start trisul with libpcap mode. You need a fast disk array to accomplish 10Gbps. Some tips to acheive 10Gbps. Set number of files in the Oper area to 200, in ref = 0, and archive = 0. Trisul is already optimized for 10Gbps write to disk, but the free 3-day License is unlikely to give you the throughput required because you cant change the above parameters. For an eval license contact us using the Support page. As an example. Assume we use 4 pipelines x 2 threads for processing and we want to say with CPUs 0,1,2,3 and 11,12,13,14 use the following.